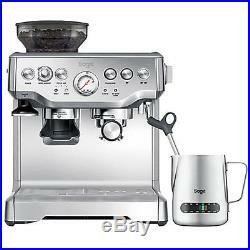 Sage The Barista Express Bean To Cup Coffee Machine BES875UK. Bringing the barista style coffee machine to your kitchen, The Sage Barista Express Bean to Cup Coffee Machine delivers top-quality tasting espressos and lattes, without having to leave your house. Eliminate the queues in your local café by grinding your own beans, giving you the freshest coffee in under a minute. With its 250g hopper, and integrated stainless steel conical burr grinder, The Sage Barista Express Coffee Machine lets you grind fresh coffee beans in your own kitchen. Almost every ingredient tastes better when fresh, and coffee is no exception. As coffee beans begin to release their natural oils as soon as theyre ground, this guarantees you the freshest possible coffee. There are 18 integrated grind settings, giving you complete control over the coarseness of your grind, and, adjustable dosage settings, so you can tailor the taste to suit you. The 15-bar pressure builds gradually, to ensure flavour is extracted evenly and efficiently. The smart features built in to the machine means it only grounds the correct amount of coffee each time, so youre not going to waste those precious beans. Grind and dose are both controlled automatically, so every cup of coffee will taste as good as the last one. Digital temperature control (PID) built into the machine ensures water is the correct temperature when it is delivered to your grounds. This ensures optimal flavour extraction for better tasting coffee. If you dont want to use fresh beans, you can also use pre-ground coffee instead. Single and double filter baskets are included in the box, so you have everything to get you started, whatever you or your guests want. Powerful Steam Wand and Temp Control Jug. If youre looking for that coffee-shop style frothy cappuccino, the high-powered milk frothing arm makes it simple to warm and froth milk. The wand performs at the level that allows complete control over the consistency of your milk, helping you enhance the flavour even try your hand at latte-art. Theres also a special stainless steel temperature control jug included, with a practical easy-to-read temperature gauge on the side. With a 480ml capacity this milk jug enables you to easily see the temperature of the milk so you can texture it at the optimum temperature. The Barista Express Black Coffee Machine also includes a large, 2L top-fill water tank with an integrated filtration system. Water is extracted making it easy to remove coffee grounds, and meaning the whole machine is quick and simple to keep clean. Sage have also included a cleaning kit, to make sure your Barista Express lasts for years to come. The Sage Barista Express Coffee Machine demonstrates the dedication to making professional looking results easy in your own kitchen, which puts their products at the very top of the class. Sleek and robust stainless steel body. Grinds, doses and extracts whole bean to cup in under a minute. Large 250g hopper holds enough for 25 shots of espresso. Integrated stainless steel burr grinder. 18 different grind settings from coarse to fine. 15 bar pressure builds gradually for even extraction. High power milk frothing arm. Stainless steel temperature control milk jug with integral temperature gauge. 2 litre water tank and integrated filtration. ClaroSwiss water filter completely eliminates the need to descale the machine and lasts 3 months. Stainless steel portafilter with 2 filters (1 single and 1 double for fresh-ground coffee); stainless steel temperature control milk jug (480ml); Claro Swiss water filter; easy-to-follow instruction booklet with a water hardness test strip inside. The item "SAGE BES875UK The Barista Express Espresso Coffee Machine+milk temp frother jug" is in sale since Saturday, December 15, 2018. This item is in the category "Home, Furniture & DIY\Appliances\Coffee, Tea & Espresso Makers\Bean-to-Cup Coffee Machines". The seller is "nigeldclegg" and is located in Oxenhope. This item can be shipped to United Kingdom.